No. 7 Richard Bland Men's Basketball Hosting CCBC Catonsville (Md.) Friday At 6 p.m.
No. 7 Richard Bland Men’s Basketball Hosting CCBC Catonsville (Md.) Friday At 6 p.m.
SOUTH PRINCE GEORGE, Va. — No. 7 Richard Bland College will host CCBC Catonsville (Md.) in a non-region men’s basketball game on Friday night, December 15, at 6 p.m. in Statesman Hall. The nationally-ranked Statesmen are 9-3 overall, including a perfect 4-0 at home this season. The Cardinals are 1-8 overall, but feature the second-leading scorer in NJCAA Division II in sophomore DeAnthony McCormick, averaging 26.0 points. Admission is free to all Richard Bland home games, while the contest can be heard locally on WHAP Radio, Fox Sports 1340 AM. No. 7 Richard Bland is playing its third game in six days following a week off for fall semester examinations. The Statesmen, who are an outstanding 113-34 (.769) over the past four-plus seasons, are coached by fifth-year head coach Chuck Moore (161-50 overall), and assisted by third-year assistant coach Preston Beverly, recently added first-year assistant coach Anthony Sally and first-year student assistant coach Brandon Henry. Through 12 games, Richard Bland has been led in scoring by 6-4, 225-pound sophomore guard Robert Smith/Hampton, who is averaging 20.4 points and 6.5 rebounds with seven 20-point games and a season-high of 31 points. He is followed by 6-2 sophomore guard Tim Bing Jr./Suitland, Maryland, who is averaging 10.9 points and 3.7 assists with six double-figure scoring games and a season-high of 21 points. Local 6-7 sophomore forward Stanley Taylor/Petersburg adds 8.9 points and 8.0 rebounds with three double-doubles and season-highs of 30 points and 17 rebounds. 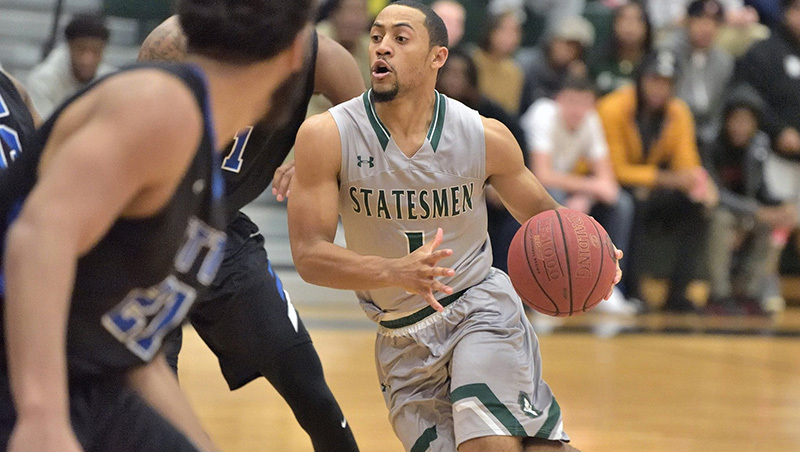 Richard Bland is averaging 91.6 points per game, while allowing 78.3 points to opponents for a scoring margin of +13.3. CCBC Catonsville is coached by third-year head coach Greate White. The Cardinals have been led in scoring by 6-4 sophomore DeAnthony McCormick (26.0), who has three 30-point games and a season-high of 41 points, along with freshmen Jasper Sterling (9.3) and Javonte Sterling (9.3). Catonsville averages 83.1 points, allowing 92.8 points for a margin of -9.7. Richard Bland and Catonsville are playing for the fourth time in the sport of men’s basketball, and the Statesmen lead the series, 3-0. Each of the three previous meetings; however, have been extremely close games decided by three points or less, including last year’s 64-63 road win on December 12, 2016, in Maryland. 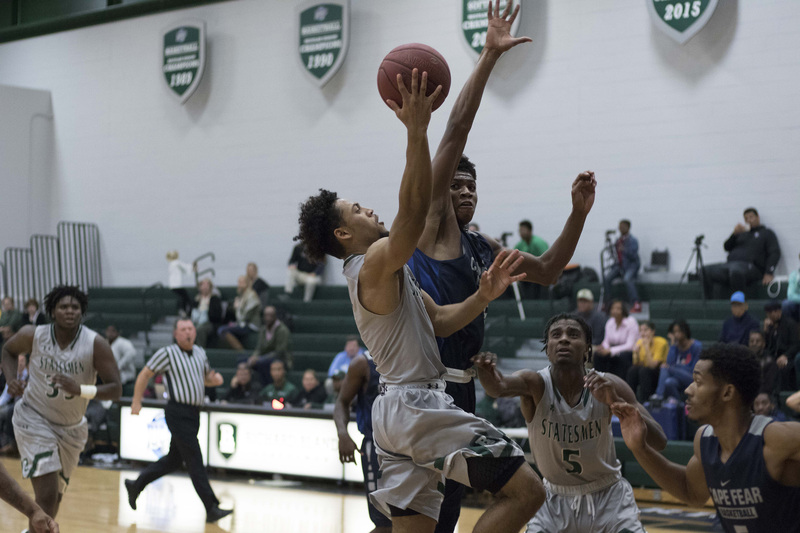 Richard Bland is playing its final game this calendar year before taking a three-week break for the Christmas and New Year holiday season. The Statesmen will not play again until visiting NJCAA Division I opponent USC Salkehatchie on Saturday, January 6, 2018, in Allendale, South Carolina.